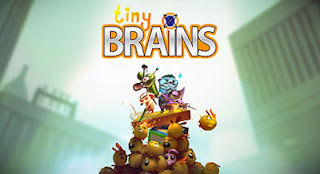 I haven't read much about this fascinating game, but what I have read about Tiny Brains makes it look like a wonderful love child of Pinky & The Brain and Ratchet & Clank (All 4 One). Really, the co-op puzzle solving using 4 individualized characters and abilities is fairly brilliant. 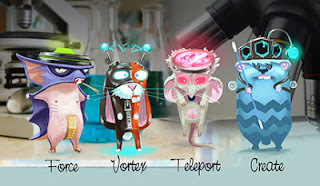 Tiny Brains is set in a lab where four super-powered animals have to work together to solve puzzles and escape from a mad scientist’s experiment. We chose this theme because now that we are indie devs and have more flexibility, experimentation is what we’re all about in our creative process. In fact, I read that there are 16 different ways to combine the various powers to solve the first level alone. Creative flexibility in game design may be a hell of a game changer for Tiny Brains. That fact by itself opens an entire world of game design up- think about that with your regular sized brains- that amounts to unlimited possibility. A small but fascinating experiment heading to the PS4. More information on the official [Playstation Blog].